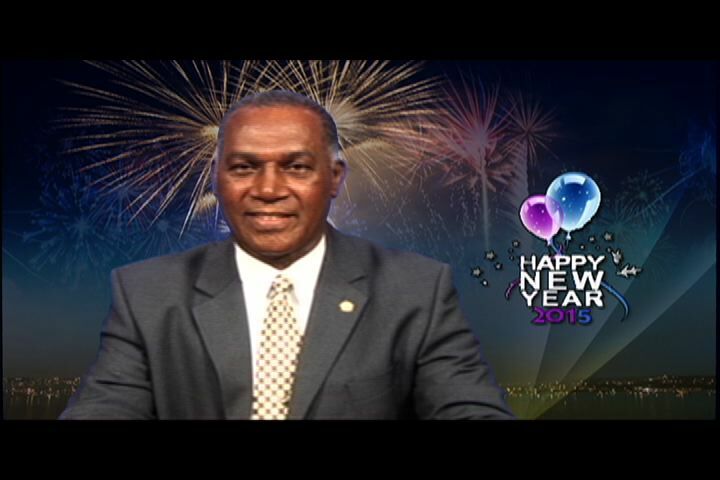 NIA CHARLESTOWN NEVIS (January 01, 2015) — The following is the full text of the New Year’s Day 2015 address by Premier of Nevis Hon. Vance Amory. My fellow Citizens, residents and visitors, we have come to the end of a challenging, eventful and in many ways a successful year. 2014 has passed and I would like to thank each of you for the efforts you have put forth in making Nevis the wonderful place that it is. The New Year is always a hopeful time, as we celebrate the end of one year and start of another. It is a time when we reflect and become conscious of our mortality and our fleeting existence. The New Year is also a time of resolutions. We each make our own, whether to live a happier life, whether we decide to work harder or rid ourselves of a bad habit. My resolution, is for us as Nevisians, to forge a spirit of unity and for us to build a stronger and prosperous Nevis for ourselves and our children. I sincerely hope that all of your dreams, aspirations, wishes and resolutions will materialise in the New Year. In many ways, 2014, was a landmark year in which many significant decisions were taken. The aim of these decisions was to create a stable and just Nevis. I am happy to report that over the past year, we have made tremendous socio-economic progress. For 2014, every index of material life and development has shown signs of improvement. Education, health, job creation, poverty reduction, tourism and physical infrastructure have all accelerated and improved. Though 2014 proved to be an eventful, challenging and successful year, we must look forward to 2015, with the knowledge that brighter days are ahead of us. We must always remember, that our development as a nation fully depends on our united efforts and focused energy. Only as a united people, can we progress and cope with challenges and solve our problems. Individually and collectively, we must all resolve to build a society where all of our people feel free and safe. We must resolve to build a better society with hope, peace and justice at its core. It is only possible to achieve this by working together as a people. However, I do not wish to dwell on the year gone by but it is important to learn from the mistakes of the past. I would like us to focus instead on the challenges of the future, so that we can all work together to overcome them and to create opportunities from those challenges. On Tuesday 16th December, 2014, I delivered a Budget which was well received by most. It was a budget geared towards expanding opportunities for prosperity and equity. Today, I pledge, that I shall provide focussed leadership in implementing that Budget. As a developing island, we have a long journey to travel to prosperity and my Government has a plan to get us to that destination. – The Construction of Paradise Palm at Paradise Estate. A 218-room Resort with an estimated construction cost of US$50 million. – Construction of Fisherman Cabana at Jessups Bay, with an estimated cost US$21.5 million and we will also see the construction of Tranquility Cove at Hurricane Hill Development, with an estimated construction cost of EC$75.3 million. My Fellow Citizens, I want to assure you on this New Year’s day, that in 2015, your Government will work to maintain an efficient government system, to provide a more resilient and robust economy and a more equitable and just socio-political climate for all persons living on the Island of Nevis. In 2015, your Government will continue to do all in its power to combat crime and anti-social behaviour. In the past year, we have lost too many of our people to senseless acts of crime and violence. As a people, we must resolve that 2015 will be the year when we slay the dragon of crime and violence. As a government, we cannot do it alone, we need all hands on deck – police and every citizen in every community to accomplish the eradication of crime and violence from our midst. This year, we must speak with one voice and proclaim to the criminals ‘enough is enough’. No longer will we tolerate senseless acts of violence. We are living in an age where, our tried and proven values have been cast aside without any regard for reason. There is also a distinct lack of respect for authority and sanctity of life. My. Fellow Citizens, this callous “free for all” is being promoted by a minority in our society who place their personal agenda above the interest of that of the country. As a law-abiding people, we must never succumb to the silence of complicity and allow our indifference to embolden the criminals. In the immortal words of Edmund Burke, “the only thing necessary for the triumph of evil is for good men to do nothing.” In this New Year 2015, let us break the silence and let us take action to preserve the peace, the security and stability of our country. My fellow citizens, in recent times, we have been bombarded by an intolerable brand of partisan politics which threatens to undermine our democracy and national unity. This brand of politics is buttressed by an abusive rhetoric which slanders, derides and defames. 2015 affords us a splendid opportunity, to turn a new page and write a new chapter in our political narrative. Those who authorize and condone the politics of hate and divide must be made to understand, that despite the fact that they have the right to speak and be heard, there are limits to liberty and that rights come with responsibility. I wish to thank all good citizens, regardless of their political persuasion, for their contribution to the difficult process of resolving the problems of our country by using non-divisive and peaceful means. My Fellow Citizens, I encourage you to continue in your noble quest of changing our political culture. This is the duty of every citizen of this country, to preserve what we have achieved and seek to build for a brighter and more prosperous future. My Fellow Citizens, the education system on our island continues to be a beacon among our neighbours in the region. In 2015, your Government intends to enhance our education system to improve on the successes of the past. The year 2014 provided us with a range of academic successes like never before. As a society, we have the responsibility to mould our young and let them soar to greater heights. We challenged our teachers and students to use the tools of education to develop better citizens, to develop communities, to develop a better country. In 2014, they responded with great academic focus, decisiveness and discipline and I am confident that we will see the positive impact on our country as time goes on. As a testament to our commitment to education, we have decided to create a department to focus solely on tertiary education. It will comprise of the Distance Education Unit, the TVET programme and other post-secondary education programmes such as Adult Education and continuing education in communities. My Fellow Citizens, in an effort to improve efficiency and rationalise supervision and administration of education on our Island, I have decided to attach the Department of Education to the Premier’s Ministry. Therefore, effective 1st January, 2015, the Department of Education will be subsumed into the Premier’s Ministry. In 2015, The Nevis Island Government will continue to acknowledge education as a sword for the weak and a shield for the defenceless. We will continue to project education as a beacon of hope and as a key to the door of opportunity for all. In 2015, we shall also seek to resolve all anomalies in the teaching service and the Public Service as a whole, to ensure that all of our civil servants are comfortable and become even more efficient and willing to serve the people of this country with professionalism and civility. In 2015, I am also challenging all of us to work towards creating a more harmonious society. Our Caribbean brothers and sisters who reside among us play a vital role in the social and economic development of our country. It is in this context, that I encourage all of our non-nationals to see themselves as part of the community of Nevis and to respect the customs, the traditions and the laws of our country. In this way, we can build an important, harmonious Caribbean society in which every person is respected and afforded an equal opportunity to live and to make a better way of life for himself or herself. In the first week of the New Year, the Premier’s Ministry will make an announcement which will demonstrate our compassion and willingness to partner with you our non-national residents here in Nevis. This announcement will highlight in a tangible manner that the approach of my Government to you, the non-nationals, is philosophically and ideologically different to that of the Opposition Party in Nevis. Our policy will provide an opportunity for all eligible non-nationals to regularise their status in Nevis. Finally, let me on behalf of the Nevis Island Administration and the people of Nevis, commend all those Nevisians who participated in Sugar Mas 43 and performed with distinction. Special mention must be made of history-making King Astro, the reigning National Senior Calypso King, for his outstanding performance of his two songs “Flush it” and “Carnival Therapy”, King Sookie the reigning National Junior Calypso King also Ms. Akisha Fergus who placed 1st runner up in the national queen contest, the Fire and Steel Orchestra which took the 1st runner up position in the Steel Band competition and Deli Ranks who took the 2nd runner up position in the Soca Groovy contest. Congratulations to each of you for your hard work, commitment and sacrifice. My Fellow Citizens, there is no greater effort than those who sacrifice on behalf of others and prove victorious. You have made all Nevisians proud. However, my Fellow Citizens, Nevisians, Visitors, Friends, we must seek to militate against the forces which seek to manipulate and undermine the autonomy of the Nevis Island Administration which is granted under the Constitution of this country. We must stand firm against any and all efforts to manipulate and abuse the electoral system by gerrymandering of the constituency boundaries. We must stand against the efforts by the Federal Government, to use the resources of the proceeds of the Citizenship By Investment Programme, as a tool to bribe the people of St Kitts & Nevis and to use the funds of the SIDF as a political war chest for self-preservation. My Fellow Citizens, despite our challenges in 2014, I am persuaded that in 2015, we will individually and collectively demonstrate great courage and determination and turn our challenges into opportunities. For the New Year, let us be more responsive, generous, kind-hearted and caring towards our family and neighbours. Let us consider how we can improve the life of those around us and improve ourselves as well. May the love of God surround you and may goodness and decency be your guide. Happy New Year all and have a wealth of health and prosperity for 2015. My God be with us and protect us from all that is harmful and help us to grow in peace and harmony, for the benefit of all of our citizens in this 2015 and into the future. My Fellow Citizens, Happy New Year to all and have a wealth of health and prosperity. God bless you.